How schooling can contribute to the city building profession. We live in our cities and experience the complexities of them each and every day. We know what it takes to make a strong and resilient city. We are a dynamic group of professional, wear many different hats and work in many different jobs, but we are all city builders. Being a city builder, however, is not a likely choice for students when they start to think about what they want to be when they grow up. The “6 From The 6ix” at Loretto Abbey CSS in Toronto work on their plan. They are (clockwise l. to r.): Sophie (Financial Director); Sabrina (Site Planner); Mena (Marketing Director); Samantha (City Liaison); Paula (Neighbourhood Liaison); Sophia (Marketing Director). If the next generation desires to be city builders, we can be confident that we will have a strong and dynamic workforce that is excited to solve the complex problems of city building in the 21st century. They can plan for better transit, improve community relations, build our cities to be more resilient both socially and physically, and create opportunities for creative design solutions to urban planning problems. Yet currently in most curriculums there is no clear path to learning that city building is an achievable profession and as a result, we are missing out on a very talented pool of future city builders. It seems as though, in the high school system, everything is there, it is just disjointed. It isn’t that school boards do not emphasize the skills and topics that promote city building. There are references to urban places all throughout the curriculum, but there aren’t courses that focus specifically on it. This issue is not something that can be easily changed. Cappadocia believes that a more immediate opportunity at the high school level may be through a new program he was introduced to this year. An example of a city block diagram used in the UrbanPlan learning curriculum. on disciplines such as city planning, real estate and architecture, the objective of which is to provide the tools for high school educators to develop an interdisciplinary approach to looking at the urban form. 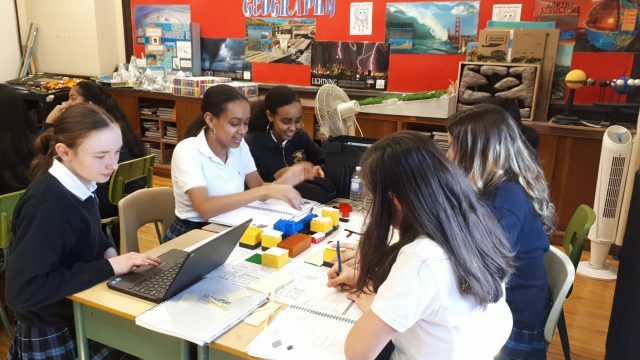 As part of the program a student will take up on of five roles: Financial Analyst, Marketing Director, City Liaison, Site Planner or Neighbourhood Liaison. Through 15 class hours of program participation, students will form development teams and respond to an RFP to redevelop a 5½ block urban infill, mixed-use redevelopment project site, and present their proposal to a mock City Council that awards the development contract to the “winning” team. 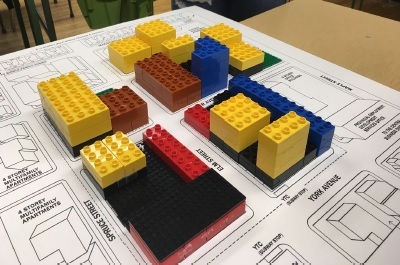 Through the process, students discover the fundamental challenges of development: how market forces (supply and demand, availability of capital, risk/reward expectations, etc.) clash and collaborate with non-market forces (regulation, politics, advocacy groups, etc.) to create the built environment. Through these roles, students develop a deeper understanding of the various stakeholders in the development process and the challenge of reconciling their often-competing agendas to create a well-designed, market responsive, financeable, and buildable project. While the program is time-heavy and non-traditional and may make educators shy away from the unknowns, Cappadocia believes that this program will be very successful across the school board. “I would never have investigated this type of program for my students had a former graduate of the school not approached me with the syllabus, he says, referring to Alexandra Rybak, who is now a director at ULI Toronto’s District Council. Now, Dr. Mehta teaches in the Urban Studies undergraduate program at Innis College. She describes the department in a similar manner to that of many other undergraduate urban studies schools. The department is interdisciplinary with courses spanning from sociology to media studies. This gives students the opportunity to learn to be critical in their urban environments. Students enter into the program in their second year at the University. Administration looks for students who have taken and received above average marks in a range of foundational urban courses from their first year, some combination of urban geography, economics, political science and sociology. Many of the students go on to get Masters in Planning, while many others also enter into related fields such as Architecture, Landscape Architecture and Real Estate. Careers in the medicine, engineering and legal professions are valued in society and lucrative opportunities for our next generation. This is the same for careers in city building. The difference is that there is no singular path to become a city builder and one does need to be a bit of a jack-of-all-trades. But there is an incredible opportunity for the next generation of jacks-of-all-trades to become professional and make a lasting impact in society. What needs to happen is to provide this dynamic group with the tools, early on in their learning, to know that this opportunity exists. We need to speak to our students with our many hats and then afford them the opportunity to try out the various jobs within our field. The greatest opportunity lies in high school curriculums becoming the catalyst students can use to better understand the field of city building, so that the next generation will know the workforce and more will enter it with as much a desire as they have to seek out other fields such as law, engineering and medicine.